"Ruby's Legacy" has been updated and looks amazing! You'll find large flat screen TV's and a Blue Ray DVD player in the main living area and master bedroom with new furniture that gives a light and airy feel to this home. 1002 is all tiled except for the master bedroom. There is a couch, with a pullout sleeper sofa and love seat in beautiful khaki and white. There is a four chair round glass dining table to enjoy a meal and two bar stools for extra elbow room. The kitchen has all the necessary items to cook a nice meal should you choose to stay in. There is a Jack-and-Jill bath that houses a stack-able washer and dryer for convenience. The master bedroom has a king size bed and is carpeted. There is an armoire with a TV and an added chest space for storage. The bunk beds are in the hallway alcove not blocking hallway space and perfect for children. 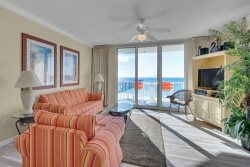 This unit has amazing views of the Gulf of Mexico and a view of the longest fishing pier in Florida. The balcony is the perfect place to sit, relax and watch the dolphins play in the emerald green waters. The view east from the balcony is beautiful, great view of the island.